Trail Ridge Road takes visitors through Rocky Mountain National Park's alpine tundra at elevations of over 3,600 meters. America’s national parks are a popular destination for tourists and vacationers from across the country and around the world. More than 330 million people visited them in 2016, enjoying the spectacular scenery and natural wonders… and increasing the need for road repairs, additional park staff and habitat restoration. For over a century, the federal government has paid to protect the parks through subsidies, plus entry fees at the most popular parks, fees that have remained relatively low and unchanged for more than 50 years. That may change next year, when the National Park Service plans to more than double the cost of a day pass at 17 of the most popular parks, including Rocky Mountain National Park in Colorado. Although not as well-known as Yellowstone and Grand Canyon, Rocky Mountain National Park is the fourth most visited park in the country, with more than 4.5 million visitors last year. An entry fee of $30 lets a carload of visitors in for a week. Many pay just for an afternoon to drive through the 100,000 hectare wilderness and admire the snow-capped mountains and pristine meadows. The park includes a huge network of hiking trails and an abundance of wildlife. 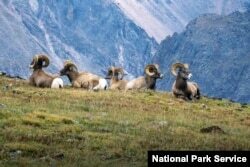 Bighorn sheep rams are among the wildlife that call Rocky Mountain National Park home. As children from Pueblo, Colorado, skip through a pine forest back to their car, their father says he’s enjoyed their visit. “We just came, like I said, to tour around a little bit." What's scaring park officials is the prospect of budget cuts. Next year, federal funding for the parks is expected to drop 10 percent, a cut of $300 million. The plan to raise entry fees at 17 of the nation’s most popular parks won’t replace that money, but it might generate an additional $70 million a year. The parks plan to use those funds to slowly help with an $11 billion backlog in overdue maintenance for aging roads, bridges, campgrounds, waterlines, bathrooms, and other wear and tear caused by visitors who sometimes love Nature to death. The increased fees will also impact businesses in towns near those parks, where tourism is the economic engine. 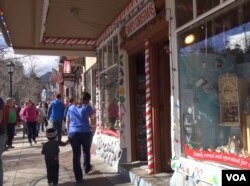 In Estes Park, Colorado, just up the road from Rocky Mountain, large crowds amble in and out of picture-perfect shops that offer everything from fancy jewelry to year-round Christmas ornaments and candied apples. Tourism is the lifeblood of Estes Park, Colorado. But a couple from Pennsylvania is more optimistic, at least about themselves. "Whatever it takes, I'm willing to pay to enjoy the scenery and nature,” the husband says. But his wife has a different perspective. "We're able to do that," she points out. "But I'm a little concerned it would be cost prohibitive, for families that can't afford $70 to come into the park." Her husband admits, "That's a good point,” as she nods knowingly. The National Park Service is taking comments on their website about the proposals until Thanksgiving. It notes that there are no plans to raise the price of the $80 annual pass, which provides entry to all federal lands, including parks, and that all but 118 of the 417 national park sites have no entrance fee.